This page has worksheets and reading comprehension passages to celebrate Women's History. Historical figures include Jane Addams, Helen Keller, Rosa Parks, and more. This is a shorter biography - only a couple of paragraphs with questions. Jane Addams was a leader in the Women's suffrage movement and founder of Chicago's Hull House. Learn about Louisa May Alcott, author of the Little Women series of books. This biographical includes questions to check comprehension. 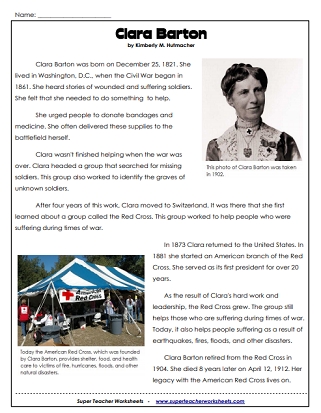 Clara Barton was a Civir War era nurse who founded the American Red Cross. This file contains a biographical reading passage, followed by a set of comprehension questions and a crossword puzzle. Learn about a remarkable woman who faced difficult challenges to become an accomplished doctor, scientist, astronaut, explorer, and astronaut: Dr. Mae Jemison. 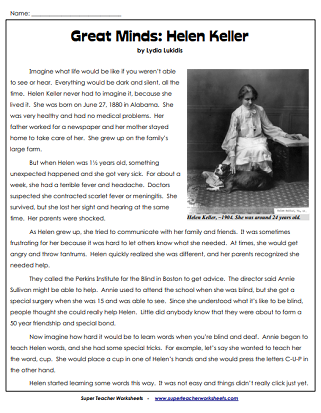 Learn about the inspiring life and legacy of Helen Keller in this middle school reading comprehension article. Comprehension questions, vocabulary words, and a writing prompt are included. Rosa Parks was an activist in the civil rights movement. She was a black woman who famously refused to give up her seat for a white woman on a bus. When you think of a courageous trailblazer, who comes to your mind? When you learn about Harriet Tubman in this historical biography, you'll see why she is remembered as a heroic and courageous leader of the abolitionist cause. Here is a picture of Sally Ride for your students to color. She was a scientist who, in 1983, became the first woman to travel to space. This worksheet has a large picture of Helen Keller that students can color. There's also an inspirational quote by Keller. 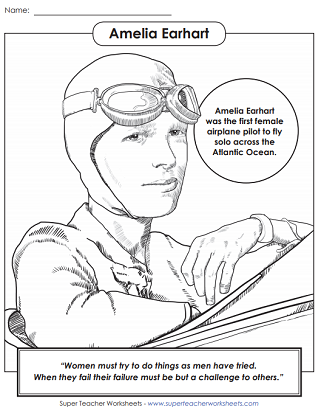 Color the picture of Amelia Earhart and read the inspirational quote at the bottom. Rosa Parks was an activist in the Civil Rights Movement. This worksheet has a picture of Ms. Parks for students to color, and an inspirational quote. Harriet Tubman was helped slaves escape to freedom by leading them on the Underground Railroad. This coloring page features an inspirational quote from Ms. Tubman. British Scientist Jane Goodall is the world's foremost expert on chimpanzees. This coloring page includes a quote about being kind to animals. Ms. O'Connor was the first woman to serve as a Justice on the United States Supreme Court. St. Patrick's Day is March 17th. Use these printable math, reading, and spelling worksheets with your class. This index page links to worksheets for all seasons, events, and holidays. Download printable worksheets to use during Black History Month (February).